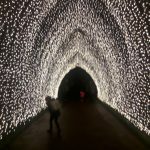 Christmas at the Edinburgh Botanics is surely one of the evening walks of the season. This year the trail boasts over a million twinkling lights, and on Saturday night it was buzzing with visitors galore. The scented fire garden by the pond is beautiful, the coloured trees glowing and eerie in equal measure, and Santa Claus and his elf – at their gingerbread house – preside in the midst of it all. 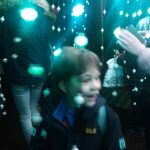 Interactive experiences are always a highlight, especially with the eight year old in tow and the walk-way through the dangling, multi-coloured ribbons of light was – for him and, it seemed all of us – magical. The Cathedral of Light, too, comprising more than 100,000 pea lights, is spectacular, ethereal – especially with the music ‘Oh Holy Night’ accompanying it. As an immersive installation, running for 70 metres alongside the Garden’s Beech Hedge, it’s almost celestial. After a somewhat lacklustre 2017, it’s great to be inspired once more by this inspiring winter trail.